Short Edition – what is it? In today’s society it seems to be the norm to do everything on our mobile phones, including reading a book. The concept of a printed hard copy story becoming popular seems farfetched, but not anymore. The availability of short printed stories, readily available at a press of a button has been introduced across France within a number of train stations has been a huge success – and is now available within the UK. Following the recent success of the machine in Europe, the Short Edition – Short Story Dispenser has been launched in the UK by All Urban, one of the UK’s leading street furniture suppliers. The tall sleek machine showcases thousands of short stories and features a range of writers from classic Shakespeare and Virginia Woolf to contemporary stories by aspiring new authors. Without the use of ink, each story is printed out on a high quality eco-paper, the size and length of a shopping receipt and is a bite-sized piece of literature which should take the reader less than five minutes to read. The success of the machine in France is a story in itself. It started out in a train station in Brest, a city within Brittany. The station manager had heard of the concept of Short Edition and installed it within the station for commuters. It was a quick success which caught the eye of rail giant, SNCF Gares and Connexions National French Railway. SNCF manage over 3,029 train stations across France and serve over 10 million people a day. They provide travellers not only with a helpful service but also entertainment to distract them. The company has previously introduced pianos, art exhibitions and concerts into stations, so the Short Edition dispenser was the perfect fit. 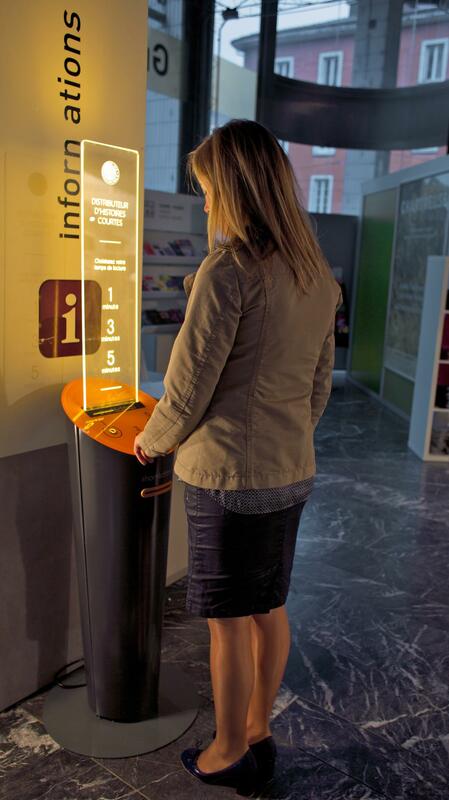 SNCF initially introduced the dispenser in Grenoble train station and within six months, over 100,000 stories were read by commuters. The service is now being rolled out across a further 35 train stations in France. The company was also impressed with its ease of use and the ease of installation and maintenance. Following this huge success in France, All Urban has picked up the mantle of introducing Short Edition to the UK and to encourage us to become a nation of readers and writers. For more information about Short Edition click here, or call the team on 0114 282 1283.